This winter has been so cold, I've found myself looking for something warm and hearty to slurp almost every single day. Which is why Wagamama has become a constant on my neighborhood dining circuit. This Asian hot spot began in London back in 1992 and has slowly built an empire with locations all over the world. Mr. T and I have eaten at Wagamama's in multiple locations; London, Copenhagen, Boston, and now of course NYC. 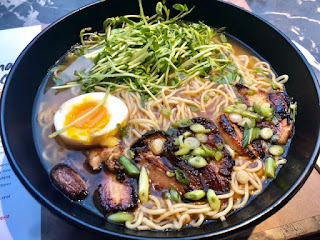 My current obsession is their wonderful Shirodashi Pork Ramen. Slow cooked pork belly marinated in bulgogi sauce then tossed into a thick chicken broth with noodles, dashi, miso and a tea stained egg. I just love how clean this ramen tastes; the rich, deep flavors of pork and chicken shine without that salty, fatty layer that coats most ramen. And the bowls are so big I almost always have enough for breakfast the next day!